Part Two – Why Blog? 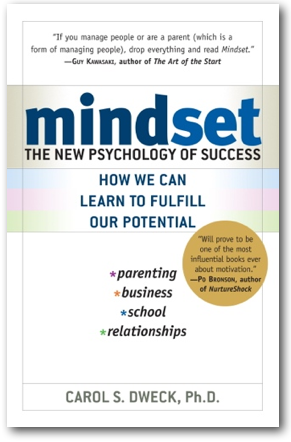 Mindset is another word that seems to be abuzz on my Twitter feed these days and also happens to be the title of a book by Carol Dweck that I am currently reading. The book, as well as much of what I am reading on Twitter, outlines the importance of approaching our goals with a growth mindset versus a fixed mindset. It discourages viewing our intelligence, abilities and talents as fixed and instead suggests that these can all be developed. My initial question when starting the book was whether or not a person could rest somewhere in the middle, or have a Dr. Jekyll and Mr. Hyde kind of mindset, and the answer is yes! Although I know I can tackle many things head on without giving up, I often stick to what I feel I can be successful at. My Dr. Jekyll side has mentally labelled what I am good at and what I am not good at, and most days I stay away from the latter. Growth mindset, that is not! Those of you who have read my About Me page already know that I am admittedly lazy, which also doesn’t scream growth mindset. But every now and then, a weird thing happens; Mr. Hyde comes out, and my husband starts wondering what my next project, idea or challenge will entail. I usually tackle it head on, but with lots of self-doubt, and usually feel like an imposter until I have repeated it successfully several times. Sometimes that feeling never goes away. This all leads to the second reason I have come to start a blog. Summer holidays can be a dangerous time for me in that if I don’t have a project of sorts to work on, I can easily slip into a lazy, unproductive depressive lifestyle for 8 weeks. Just the other day while out for a walk with my dad, we discussed this useless feeling I get when off work for too long. Well, Mr. Hyde showed up the next day determined to start a blog! Some of you may be saying “A blog?! Woop-de-do!” Well let me explain. As far back as Grade 9, I can remember labelling myself as a bad writer. My twin sister Emily did the same but with Math. Our solution throughout high school, although not smart, was simple; I did the Math homework and she did the writing assignments. This mostly faired us well throughout high school, but did little to develop our skills in these areas, and unfortunately trading exams at the end was not an option. Scoring 48% on the grade 12 provincial English exam did little to boost my confidence as a writer, and written tasks continued to be my nemesis throughout university (and still do to this day). Emily’s final math grade of 50% had equal effects on her belief in herself as a mathematician. Our fixed mindsets decided early on that these were things we were just not good at and never would be. You can likely now appreciate why when Mr. Hyde (growth mindset) showed up with a plan to write, the very thing that Dr. Jekyll (fixed mindset) had decided I am not good at, my first instinct was to shut it down. I mostly set the idea aside thinking it would be silly to take on the very thing that I am rubbish at, but every time I picked up Mindset to read the next chapter, I had to consider why I was even reading the book if I was not willing to live it. My final push, funny enough, came in the form of a blog post. It was by George Couros and titled “4 Reasons People Don’t Blog and Ideas to Help Change Their Mind.” My nervous desire to develop more of a growth mindset in regards to writing (and other areas), combined with his debunking of many of my other excuses for not starting a blog, meant I had no choice. So here I am, a newbie blogger with imposter syndrome writing my second post! What challenges have you taken on that were outside of your comfort zone? Have you given yourself labels or been given labels by others that have stuck with you and stopped you from taking on certain challenges? What do you do to model resilience, risk-taking and a growth mindset for your students or children? Next Post Part Three – Why Blog?